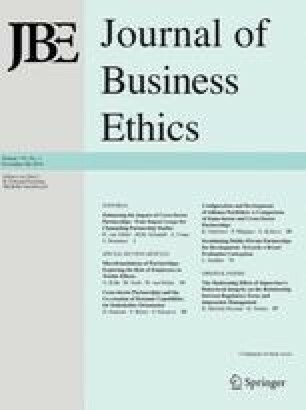 This comment is offered in response to Hansen's “A Multidimensional Scale for Measuring Business Ethics: A Purification and Refinement”. Five issues arising from Hansen's purification and refinement efforts are addressed. These include the issues of parsimony, predictive validity, collinearity, reliability, and what we see as a confusion between normative and positive theory. Dr. R. Eric Reidenbach is Professor of Marketing, and Director of the Center for Business Development and Research at The University of Southern Mississippi. He has written extensively on business and marketing ethics. Dr. Donald P. Robin, Professor of Business Ethics and Professor of Marketing, is coauthor with R. Eric Reidenbach of two recent books on business ethics with Prentice-Hall. He is a frequent lecturer on business ethics and is the author of several articles on the subject.